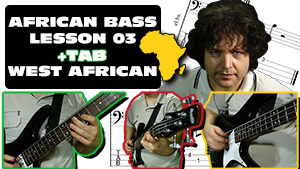 This bass guitar tutorial – as well as its tablature – demonstrates a West African piece, and I play it in my usual kind of fingerstyle, using a thumb pick and three fingerpicks. This particular musical style is played in countries like Mali, Senegal, Ghana or Sierra Leone, among others. The song has a simpler and a more complex, high energy part. Notice that even though it’s written in A major, it is really in B dorian mode, with a ii-V chord structure. The key to play the first part how it’s meant to be played is to try to restrain yourself and sit back into the groove. If you listen & watch this section carefully, you can see that I actually play those phrase starting quarter notes with little downward slides added for embellishment. 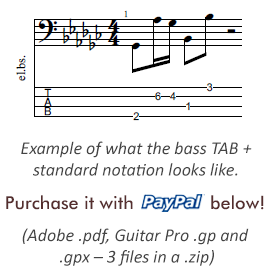 This part of the example also contains a syncopated riff. You need to play this when you are in the 3rd repetition of the sparser section. The busier part of the song spans across all 4 strings (in case of a four string bass) of the instrument. It consists mainly of 16th notes, and it’s really where the money is, so to say. If you watched my soukous bass lessons, this part is kind of like a sebene, though this music of West Africa is of course way different from the Congolese etc. styles. You need to use every finger of your fretting hand if you want to play this lick accurately. Not only that, but check out that picking hand! It utilizes the thumb as well as each one of the fingers wearing a fingerpick. Both hands’ fingers need to land on their required position in time, be it a fret or a string, depending on whether it’s a picking or a fretting hand. It means that this section is right in the centre of the pocket – no laid back feel required this time. Pay attention to mute the strings you don’t play at any given moment, to reduce unwanted string ring & playing noise. The piece repeats each section twice, and ends on the open low E string. Note that this ending is a quick 4th note, followed by an instant mute executed by the palm of the picking hand.